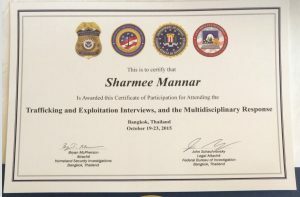 As part of her training as a child protection worker, Sharmee Mannar participated in a week-long course on “Trafficking and Exploitation Interviews, and the Multidisciplinary Response” from October 19-23, 2015 in Bangkok, Thailand. 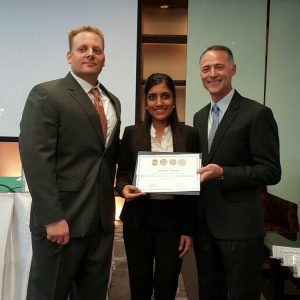 This was organised by the Legal Attache Office of the Federal Bureau of Investigation (FBI) and Homeland Security Investigation (HSI). 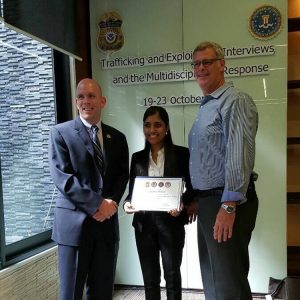 The primary objective of the course was to teach participants the multi-step process of forensically interviewing the victims of child exploitation to elicit responses in both a developmentally-appropriate and legally-defensible manner. The course also provided instruction on how to best consider a child’s cognitive, social and memory abilities, and how to consider social context. The participants also learned how to question a child in a manner appropriate for the child developmental status by using open-ended questions that elicit truthful and accurate responses. Other topics discussed included task force administration, resources allocation MLATs and non-governmental organisations and law enforcement collaboration. 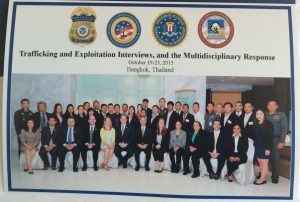 The course was attended by law enforcement investigators, non-governmental organisation, and social welfare entities who are involved from the beginning of an investigation, dealing with the victims of abuse, until the eventual prosecution. Sharmee attended the “Trust Women Conference” sponsored by Thomson Reuters Foundation.